So, this month went by really fast. Am I the only one who noticed that?? Geez. I finished reading the time-travel novel, The Time Traveler's Wife, and went back to read a book called Time After Time, which I'd read years ago and really liked. I really like time-travel stories. I finished reading it tonight, just posted it on my reading list and looked it up on amazon to make sure I had the spelling of the author's name right. Consequently, I discovered there are three sequels! I may just be forced to order those since I really enjoyed the first book and it is summer, when I do a lot of reading. The most recent book takes place during the Civil War. And I missed this? I had a cold the last couple of days. At first, I thought it was just allergies. That's the weird thing about colds. By the time I realize it actually is a cold, I'm starting to feel better! I just slept for the last couple of days and felt a lot better today. I even went to the gym so I guess I'm on the road to recovery. I am officially on vacation now. I interpreted Northport's graduation ceremony this afternoon for Josh and Ridhima. Ginger and Karen were there and after the ceremony, we waited for Ridhima to meet up with her Mom and Aunt and got a little emotional saying goodbye. I can't believe the program is over and these are the last two students from our classroom to graduate. So strange. This was also the first time I interpreted by myself. As I tried to walk onto the field, I was stopped by a security guard who told me I had to walk around to the bleachers. I explained that I was interpreting the ceremony and had to get onto the field. She said, "Well you'll have to prove it to me because I was told not to allow anyone except band members." So, I opened the program, showed her my name and said, "That's me, that's my name. I've been doing this for years." I guess I was convincing enough. She let me through. Geesh! I don't think Josh and his family knew I would be interpreting. I walked up to the platform and Josh signed to me, "Elementary school, middle school and now high school". Actually, he forgot one, preschool. 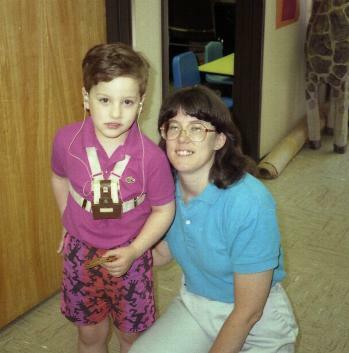 My first job as an interpreter was at Just Kids Preschool and I worked with Josh for the first time when he was 3 1/2 years old. When Josh entered the BOCES program in fourth grade, I couldn't believe I was working with him again. So, I have interpreted his preschool "graduation" and moving up ceremonies from elementary school, middle school and now high school graduation (as well as his National Honor Society induction). Let's face it, you can't write a story like that! Yep, I closed my eyes in both pictures! Some things never change. This was one great party! Wow! I was slightly intimidated by the fact that the deaf dance better than I do, however! 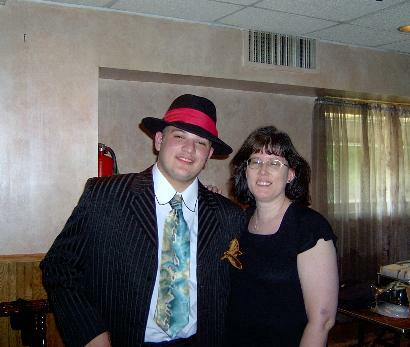 Josh's Mom said that Josh planned to "make an entrance" and did he ever in that zoot suit. I couldn't believe it. Today is my last day at Sachem. I'm helping out with graduation practice. After that, I'll stop by Northport to pick up the speeches for Sunday's graduation. I'll be interpreting it by myself for the first time. We'll see how that goes. Last night, I interpreted Ridhima's tech graduation. It was nice to see her and the teachers and students I knew at Manor Plains. The weather is a little iffy today and still on the chilly side. Considering it's almost the end of June, 70 degrees is pretty cool. You still need a sweater or something in the evening. I shouldn't complain. We still haven't gotten the pool open yet. After this weekend, I plan to do a few chores around the house. Not major things like the past few years, just minor painting and decorating, things I've put off. We have some vacation plans but I'm looking forward to doing these little chores, doing some crafting and playing with that Knitware program. Of course, I'll also have time to send out those all important resumes! I'm in the middle of a good book called The Time Traveler's Wife by Audrey Niffenegger. I love time travel stories. This one is a little different from what I've encountered before so it took me a little while to figure out the rules of this time travel experience. It's really sweet. Well, I'm off. 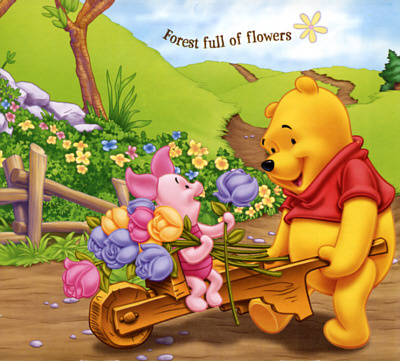 Have a pleasant day, everyone. On this date in 1777, the Continental Congress in Philadelphia adopted the Stars and Stripes as the national flag. 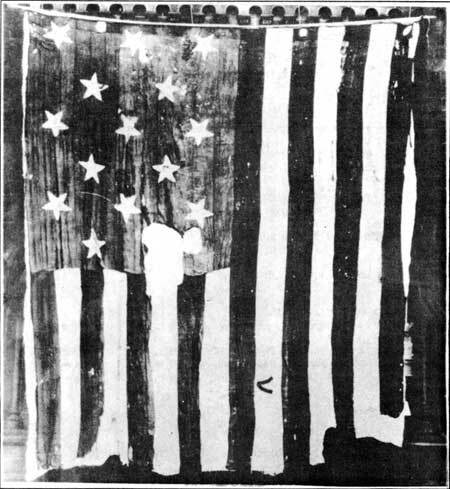 Although the design of the first flag is generally attributed to Betsy Ross, there is no direct evidence to support this claim, which was promoted by Ross' grandson, William Canby, who generated quite a bit of publicity in the 1870's. No one knows what happened to the first flag but it may have been designed by Rep. Francis Hopkinson, who signed the Declaration of Independence and was also involved with designing The Great Seal of The United States. The original banner had 13 alternating red and white stripes and 13 stars in no official arrangement. The 13, of course, was to represent the 13 original colonies. For every new state, a new stripe and star was added and by 1795, the banner had 15 stars and stripes. The Flag Act of 1818 stated that the flag would have 13 stripes to honor the original colonies and only a star would be added for each new state. The 48-star flag was the longest national flag, from 1912 to 1959, when two stars were added for Alaska and Hawaii. The flag that flew over Fort McHenry during the War of 1812 inspired Francis Scott Key to write "The Star Spangled Banner". Over the years, parts of the flag were cut off for souvenirs but The Smithsonian Museum is in the process of restoring it. It looks like I need to look for another job for the fall school year. An interpreter who was on leave for the last three years is returning in September. It doesn't matter, really, because there are two students who will graduate next year, which means I would have lost the job anyway. So, I might as well make a change now. At least I have time to search. I just didn't want to find out in mid-August. Even if I find something part-time, it will be fine. The weather is beautiful this weekend. I'm going over to Smithtown later today. Today is "Smithtown Day" and there is a street fair set up on Main Street. There will be a stage in front of the theatre and they will have a short performance every hour of music from the upcoming shows. I plan to videotape. I'm really looking forward to it. Bill and I went to see The Odd Couple on Thursday evening. He really enjoyed it. It's such a funny play. Today is Douglas' last day in Little Shop. Rob Evan will be taking over for him. Joey Fatone is replacing Hunter Foster and the Audrey understudy, Jessica-Snow Wilson will replace Kerry Butler later this month. Now let's get out and enjoy this beautiful day! June is busting out all over? Well, not exactly. I'm still wearing a jacket outside. What weird weather. I shouldn't complain. We've had some real nice days with some rainy days as well. I guess it's spring weather, all the rain, and we haven't had much heat yet. It's the first real spring we've had in a long time, come to think of it. I apologize for taking this long to kick off June. It's been a really busy week. Whenever I'd get to the computer, I was just too tired to go through this process of changing months. I was under some stress because I was searching for an interpreter to help me do The Odd Couple this past Thursday evening. At the last minute, the Sunday before, I had some luck. On Thursday, I met this guy for the first time, we looked over the script for an hour and just jumped right in. It was a little chaotic in the beginning but we got it together. We didn't have a deaf audience but there were interpreting students and a woman who works with deaf children in the audience. Also on Thursday, I went on a field trip to Fire Island. I grew up on Long Island and I'd never been there before. The ferry ride is really nice and we had a relaxing day. When I got home, I took a shower, Kelly and I had our nails done, I grabbed a sandwich from Subway and we went to the theatre. I think I'm still recovering. Douglas' next project is in The Shakespeare Theatre in Washington, D.C. - Macbeth, August 31 - October 24. Time to plan a road trip! Apparently, this is the project he mentioned that he really wanted to do. The program at the gym is going well. I like learning to use some of the machines I've never attempted and I'm also learning some things I can do at home, like using free weights. I met with the nutritionist yesterday as well and learned some new things I didn't know. That's the wrap up. One week and two days until vacation. I don't know if I'll be working this summer or not but I suppose I'll find out on Friday, when there is a meeting for the interpreters about next year's schedule. I sure hope I'm ON next year's schedule! Time to open the pool! It's June!